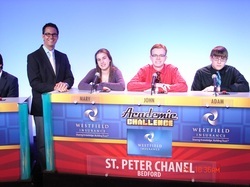 Three Chanel students represented Chanel in the Academic Challenge competition on Sunday, October 23. The students answered math, history, science, and miscellaneous subject questions while competing against two other Northeastern Ohio schools, Kirtland and Saint John’s and Paul, all while live on News Channel Five. The team placed third in the competition and gained a unique educational experience. Academic Challenge is moderated by Mr. Lemasters.